Coastal California growers, pest control advisors, and other field professionals might be on the alert for early outbreaks of lettuce problems caused by viruses. 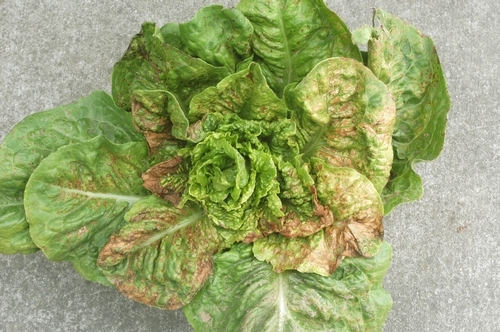 In particular, early confirmations have been made of the Tomato Spotted Wilt Virus (TSWV) on lettuce in this region. Affected leaves have tan, brown, or blackish spots and dead areas; this necrotic tissue can resemble damage caused by pesticide or fertilizer applications (see photos below). Some leaf yellowing can also be observed. If disease is advanced, symptoms can also be found on the newer leaves near the center of the plant axis. If plants are affected early in their development, growth can be stunted. 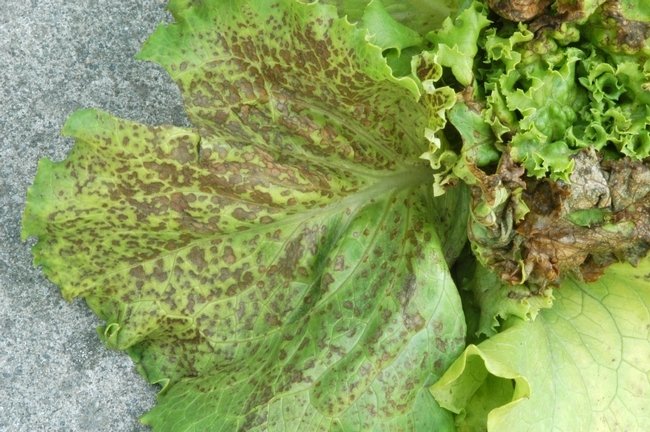 Symptoms caused by TSWV in lettuce are indistinguishable from symptoms caused by the closely related Impatiens necrotic spot virus (INSV) which in some seasons can be commonly found on lettuce in the Salinas Valley. All lettuce types (iceberg, romaine, greenleaf, redleaf, butter) are susceptible to both TSWV and INSV. Both viruses are spread by thrips, are found in hundreds of crop and weed species, and are not seedborne. In our coastal region, TSWV and INSV are spread only by the western flower thrips (Frankliniella occidentalis). Our laboratory has confirmed TSWV on lettuce in late March, which is rather early for such developments. 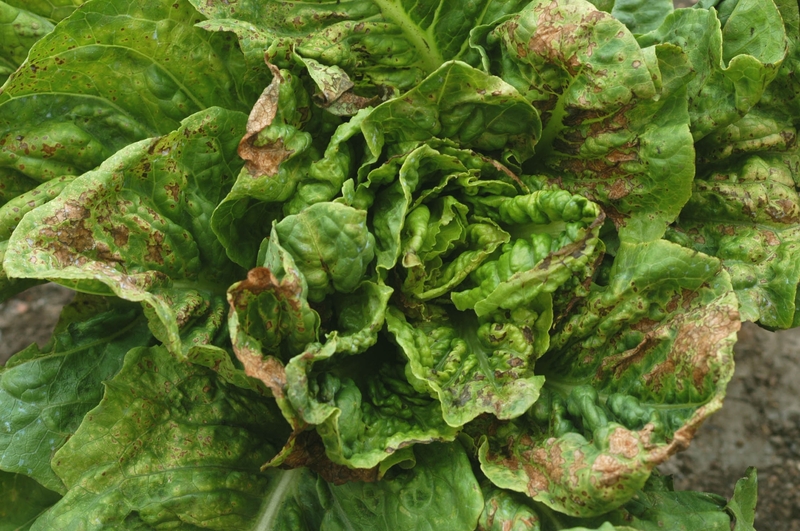 PCAs also report early buildups of thrips populations in lettuce and other fields. The relatively dry spring is resulting in early drying up and senescing of weeds and hillside vegetation; this early decline of surrounding vegetation very likely is driving thrips populations into fields earlier than normal. Lettuce growers should be aware of possible early problems due to thrips vectoring tospoviruses into their fields. Lettuce with tospovirus-like symptoms can be sent for analysis to the UC Cooperative Extension diagnostic laboratory in Salinas. Tomato spotted wilt on lettuce. 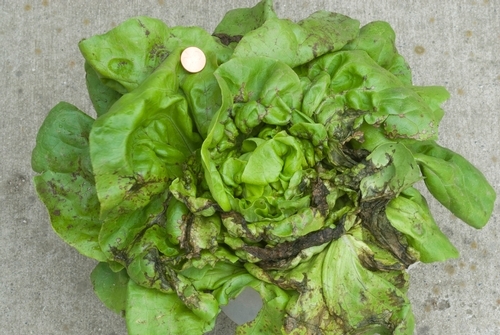 Beginning in early April, 2012, the UC Cooperative Extension diagnostic lab in Salinas began to receive lettuce samples exhibiting obvious symptoms of a virus problem. Samples continued to be submitted throughout the month. All samples tested positive for the thrips-vectored Impatiens necrotic spot virus (INSV). 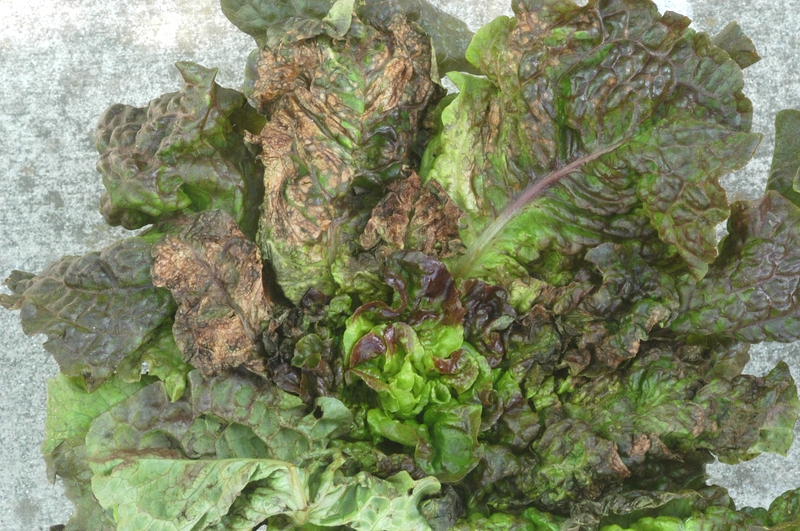 This virus first began to cause damage to California lettuce in 2006. Since that time, INSV has occurred to a greater or lesser degree every season. However, significant INSV outbreaks usually are found beginning in late May or early June. Seeing INSV on lettuce in April is therefore unusual and growers and pest control advisors should carefully monitor these situations. INSV-infected plants have leaves with brown to dark brown spots and dead (necrotic) areas; this necrotic tissue can resemble burn damage caused by pesticide or fertilizer applications (see photos below). Affected leaves can be distorted and twisted. Extensive necrosis can cause much of the leaf to become brown, dry, and dead. Some leaf yellowing can also be observed. Yellowing and the brown spotting tend to be observed on the newer leaves near the center of the plant’s growing point. If plants are affected with INSV early in their development, growth may be stunted. All lettuce types are susceptible, and INSV has been confirmed on iceberg, butterhead, romaine, and leaf lettuces. INSV can infect many other crops and weed species; the virus is vectored by the Western flower thrips (Frankliniella occidentalis). 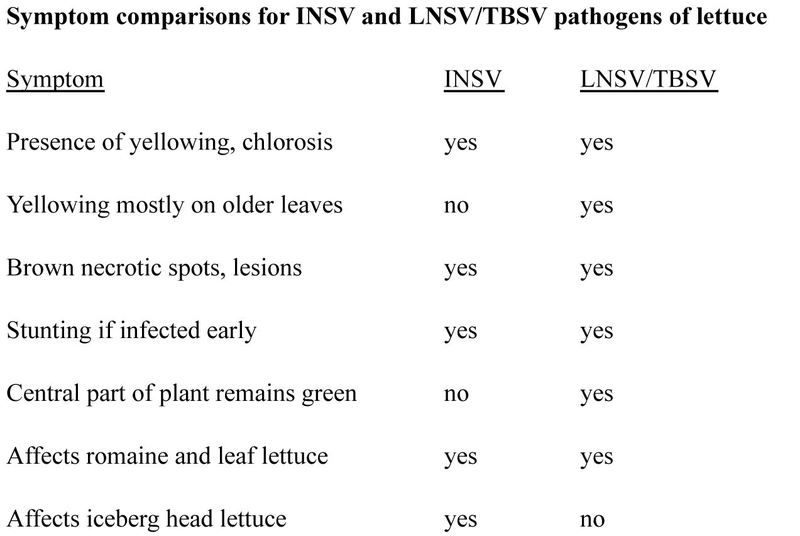 Growers, PCAs, and other field personnel should exercise caution in diagnosing INSV disease because the lettuce dieback viruses cause very similar symptoms (see table below). 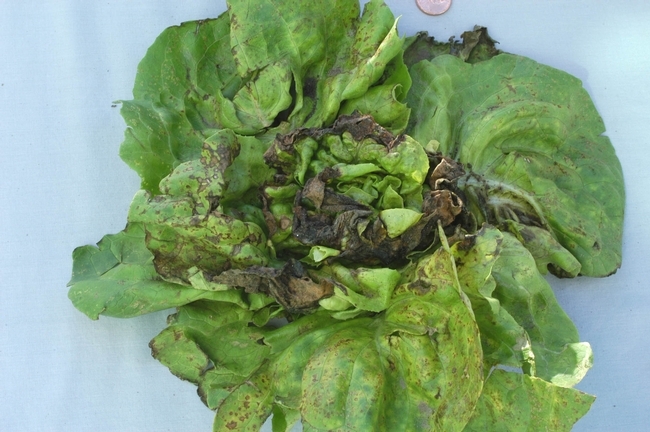 Lettuce dieback is caused by two pathogens: Lettuce necrotic stunt virus (LNSV) and Tomato bushy stunt virus (TBSV). 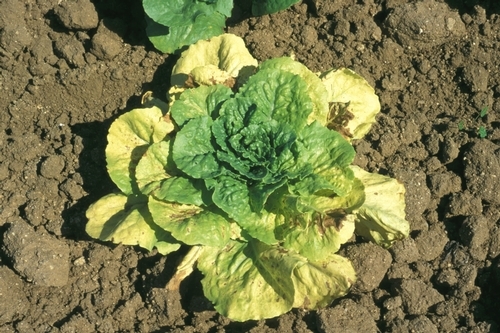 Infected lettuce can be severely stunted, especially if infected early in plant development. The oldest, outer leaves can be severely yellowed. Brown, necrotic spots and lesions later develop in these outer leaves. The younger, inner leaves remain dark green in color, but can be rough and leathery. 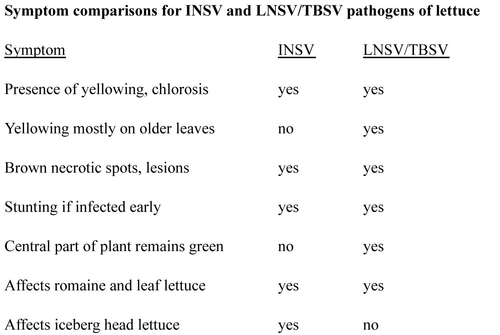 LNSV/TBSV infects only romaine, butterhead, and leaf lettuces; modern cultivars of iceberg lettuce are immune. The LNSV/TBSV virus complex is a soilborne problem and no vector (insect, nematode, fungus) is known to spread these viruses. For help in diagnosing these and other plant problems, submit samples to the UC Cooperative Extension diagnostic lab in Salinas. 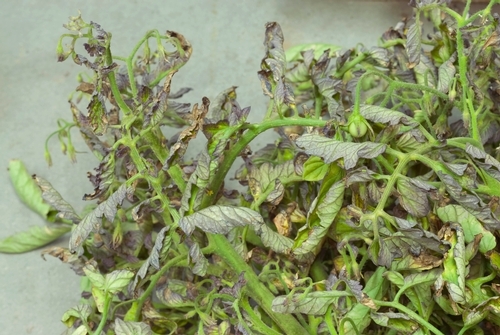 Photos: Impatiens necrotic spot virus (INSV) on lettuce. As the coastal California lettuce crop heads into the ending fall season and as the inland county region initiates its fall lettuce cycle, both crops are being affected by Tomato spotted wilt virus (TSWV). Diseased plants have leaves with irregularly shaped, brown to dark brown lesions and dead (necrotic) areas (Photo 1); this necrotic tissue can resemble burn damage caused by pesticide or fertilizer applications. Chlorosis (yellowing) can also be observed. Depending on the age of the plant when first infected, these necrotic and chlorotic symptoms can occur on both the older, outer foliage as well as the younger, inner leaves. If plants are affected with TSWV early in their development, growth may be severely stunted. 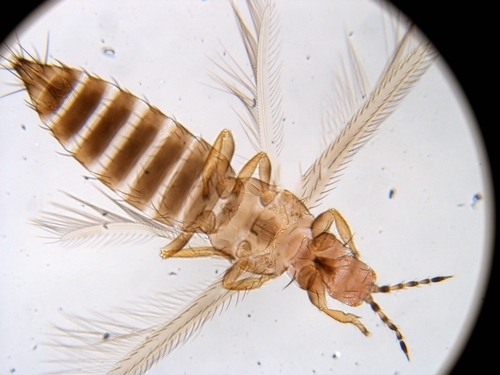 The virus is vectored by thrips and in California is primarily spread by the western flower thrips (Frankliniella occidentalis) (Photo 2). Growers and pest control advisors should exercise caution if attempting to identify TSWV in the field and without testing. 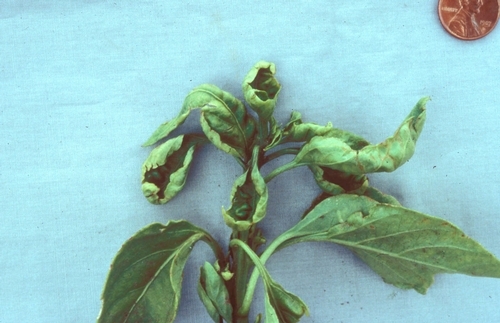 In the coastal region, symptoms caused by the very closely related, thrips-vectored Impatiens necrotic spot virus (INSV) are identical to those caused by TSWV. 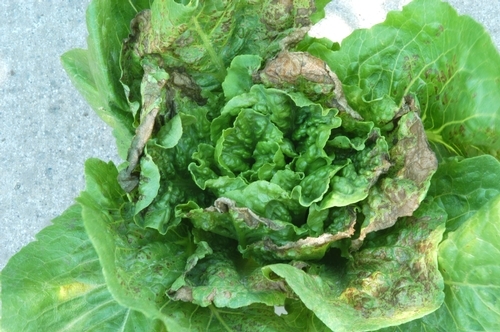 Romaine and leaf lettuces are susceptible to the lettuce dieback virus complex (Lettuce necrotic stunt virus [LNSV] and Tomato bushy stunt virus [TBSV]) which is also common on the coast. 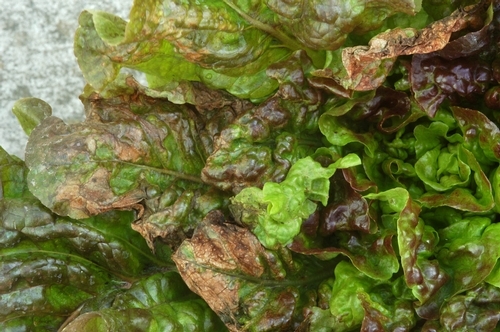 Photo 1: Tomato spotted wilt virus (TSWV) on lettuce. Photo 2: Western flower thrips, vector of TSWV. 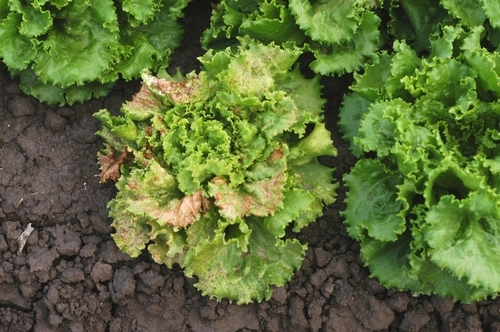 Two important virus pathogens have been affecting coastal lettuce crops for a number of years. As expected, both problems have shown up again this summer of 2010. These virus diseases are familiar to experienced growers and pest control advisors. However, one should exercise caution in diagnosing these problems because their respective symptoms can resemble each other. Impatiens necrotic spot virus (INSV): INSV-infected plants have leaves with brown to dark brown spots and dead (necrotic) areas; this necrotic tissue can resemble burn damage caused by pesticide or fertilizer applications. Extensive necrosis can cause much of the leaf to become brown, dry, and dead. Some leaf yellowing can also be observed. Yellowing and the brown spotting tend to be observed on the newer leaves near the center of the plant’s growing point. If plants are affected with INSV early in their development, growth may be stunted. All lettuce types are susceptible, and INSV has been confirmed on iceberg, butterhead, romaine, and leaf lettuces. 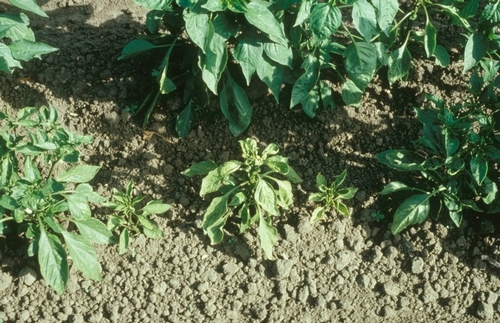 INSV can infect many other crops and weed species; the virus is vectored by thrips. 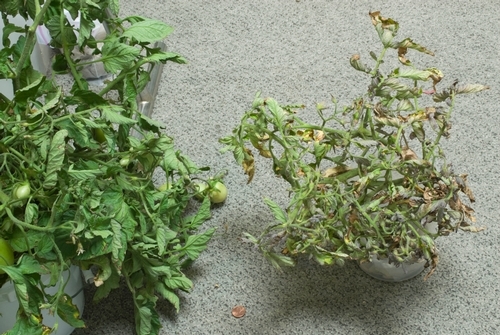 Lettuce necrotic stunt virus (LNSV) and Tomato bushy stunt virus (TBSV): Diseased lettuce can be severely stunted, especially if infected early in plant development. The oldest, outer leaves can be severely yellowed. Brown, necrotic spots and lesions later develop in these outer leaves. The younger, inner leaves remain dark green in color, but can be rough and leathery. 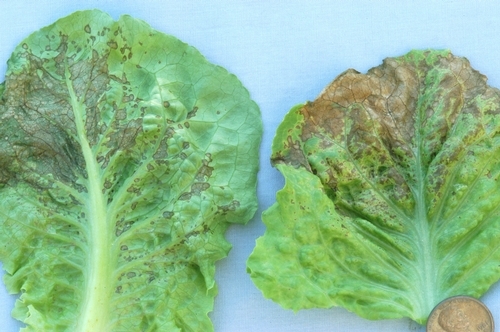 LNSV/TBSV infects only romaine, butterhead, and leaf lettuces; modern cultivars of iceberg lettuce are immune. The LNSV/TBSV virus complex is a soilborne problem. No vector (insect, nematode, fungus) is known to spread these viruses. See table below for comparison of these virus disease symptoms. For help in diagnosing these and other plant problems, submit samples to the UC Cooperative Extension diagnostic lab in Salinas. 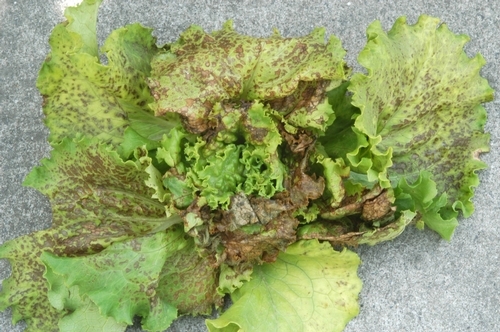 Lettuce necrotic stunt virus (LNSV) on lettuce.